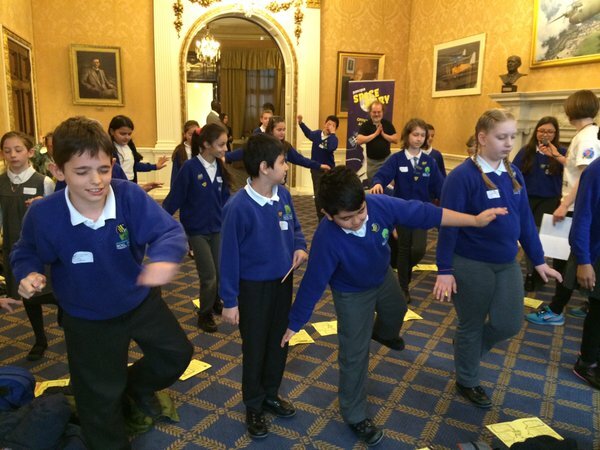 The first activity in the Principia Space Diary is a 5-station Astronaut Workout. Children will do a range of exercises while they learn what it takes to be an astronaut. You can also connect this activity to childrens’ own experiences by asking them how having a healthy mind and body (just like an astronaut) could help them in their own life. Not the outer space kind! You will need a space large enough for children to spread out their arms without touching anyone else. Space Apprentices need to be able to lie down on their tummies for the ‘Floating’ exercise, so make sure the surface is suitable. 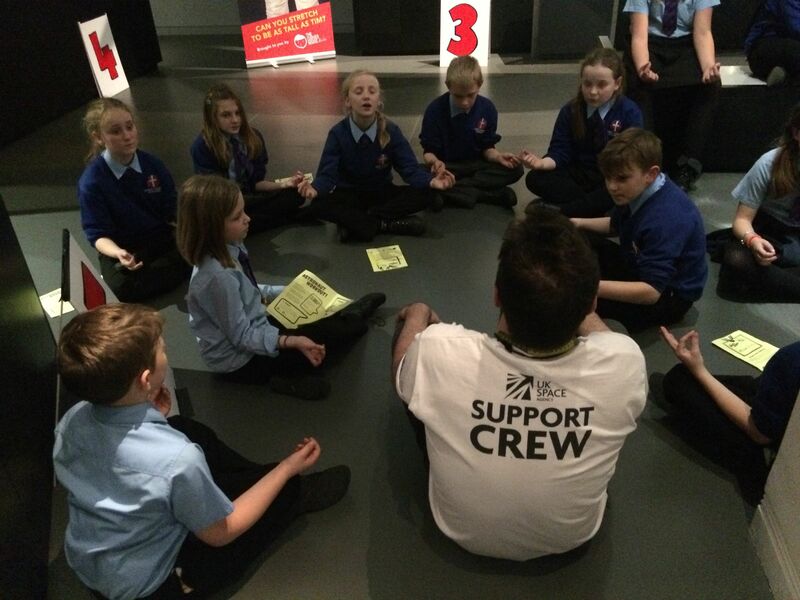 You’ll need adults to supervise and guide your Space Apprentices through the activities. You can either have one adult per station (so 5 adults in total) or one or two adults per group. Or, you could ask older children to supervise younger children with one adult overseeing everything. 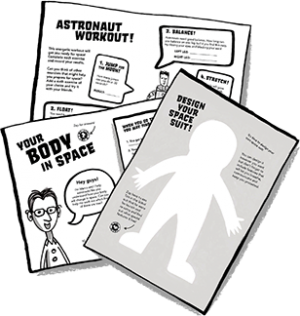 A print out of the Astronaut Workout sheet for each child participating. Pencils or pens so students can record their results. The Workout station signs (included in this document). A stopwatch or timer – you’ll need four if you’re running activities 1, 2, 3 and 5 simultaneously. If extra stopwatches are available, older or more capable Space Apprentices might like to participate by timing their classmates. Images of spacesuits (we’ve provided some below). For the ‘Stretch’ exercise, you’ll need to either mark 183cms against a wall (this is Tim’s height when he is wearing his special EVA spacesuit) or you can print a huge banner we have provided with a picture of Tim! If you have plenty of room, set up five different stations – one for each of the Astronaut Workout activities. If space is limited, you can use the same area for all five Workout activities. If you have five adults, divide your students up into six groups and have them complete the different stations simultaneously. If you only have one or two adults to run the workout, limit the number of students participating in each round and run the activities one at a time and in the one space. If you have several stopwatches, you can ask your Space Apprentices to time each other for activities 1, 2, and 3. Astronauts need to be fit and healthy before they fly to space. They exercise regularly so that they are at peak fitness when they take flight. They take part in a range of different exercises: aerobic, anaerobic, co-ordination, weight bearing and balance activities. The Astronaut Workout is designed to be physically energetic but students also need to count, measure and document their results. the ISS while stretching their arms out wide and strengthening their core. Jump: On Earth, humans experience the effects of gravity as a constant force pulling on the human body. By jumping you are trying to defy gravity. Jumping activities are weight-bearing activities that help build strong bones. Balance: Develop core muscles and posture. This is important for astronauts like Tim because the Soyuz capsule that will take Tim from Earth to the ISS is very small and the journey is gruelling. Tim needs strong core muscles. Stretch: The human body actually stretches in space as there is no gravity to keep the bones compressed. Students can work as a team to measure each other, using the banner of Tim Peake as a reference point, if it’s available. Breathe: Lots of things can go wrong in space, so it is critical that astronauts have strong, calm minds. They need to be able to deal with problems in a calm and efficient way. This mindfulness exercise gets the kids to focus their minds so they, too, can tackle any problem. For children with physical limitations that make it difficult to participate in some of these activities, we encourage you to ask them to invent their own astronaut exercise, based on their own abilities or needs, and have the other children complete that one too. 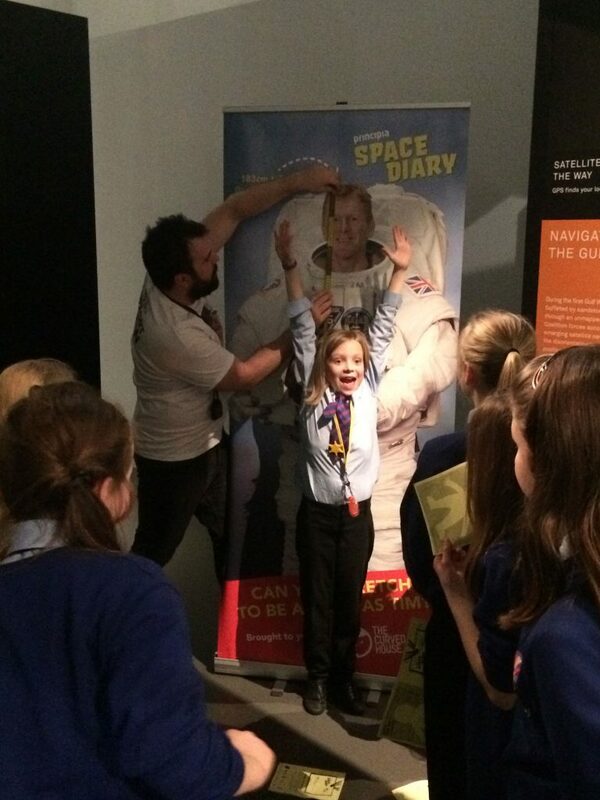 Can you stretch to be as tall as Tim Peake? 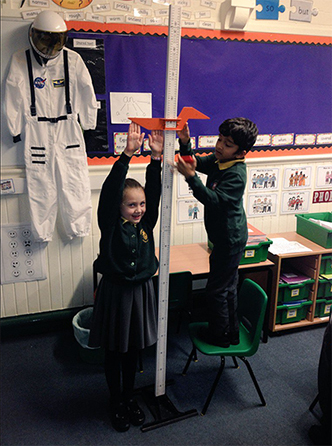 Shrubland Street Primary try to stretch to be as tall as Tim PeakeWe love seeing Space Apprentices completing their Space Diary challenges. Don’t forget that you can share photos of your Astronaut Workout by using #spacediary on Twitter, Facebook or Instagram. When you do this you’ll appear on the Space Diary Mission Feed: . Just remember to clear all permissions with parents and guardians before sharing pictures of your students.